Zombie Kickball rises again JUNE 10! 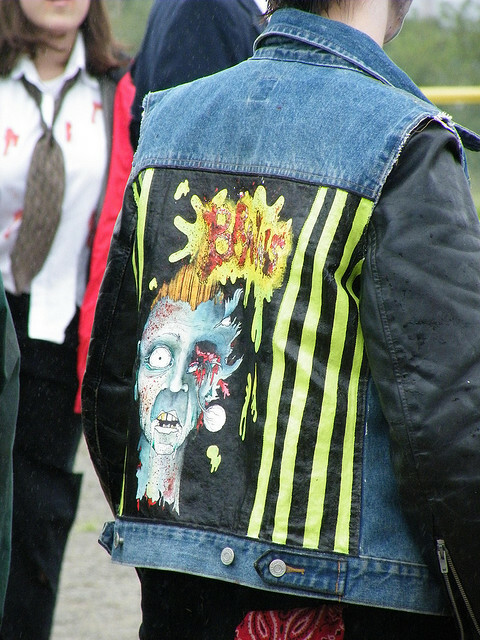 Paint for brains! Photo by Michelle Souliere, 2009. Oh boy oh boy! The grass is green on the Eastern Prom, and the skies are blue. 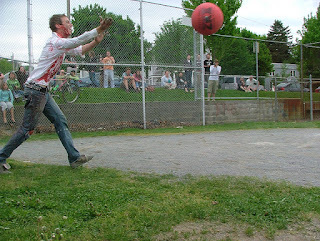 What else can that mean but IT'S TIME FOR ZOMBIE KICKBALL AGAIN!!!? Break out the shin guards and parasols! Sooner or later... he WILL get to 1st base. Photo by Michelle Souliere, 2009. 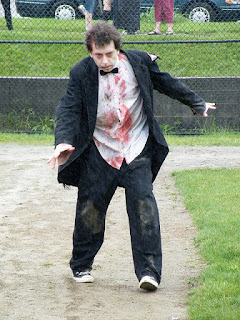 Come dressed to play a rousing game of kickball with the undead! Spectators are welcome, as zombies when kept busy amusing themselves behind fences are quite entertaining. Weather is often variable, so be sure to check the forecast when arranging your costume. There has been a year or two when the victims' brains were mixed liberally with mud as rain started coming down. Costumes are up to you -- are you a serious phase-three latex and rotten gore zombie? An oatmeal and red syrup zombie? The choice is all yours! Zombie hunters may also find this a excellent opportunity to don goggles and protective overwear for a little fun in the sun. Hey, if you're well-armored, why not join one of the teams? It's been done before. No one's been eaten yet. Family groups are also a popular team-costume option. Best family photo op EVER!!! Astound the relatives at Christmas. Believe me, they won't be expecting a holiday photo like that! 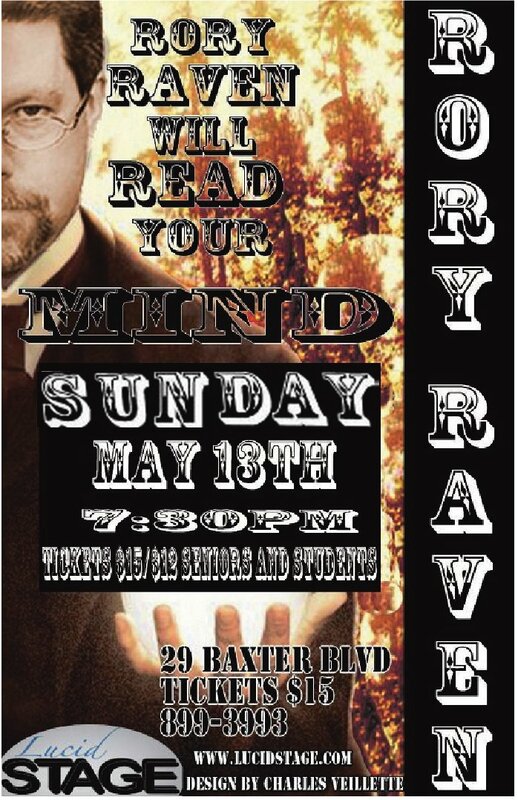 EVENT: Mother's Day mentalist show! 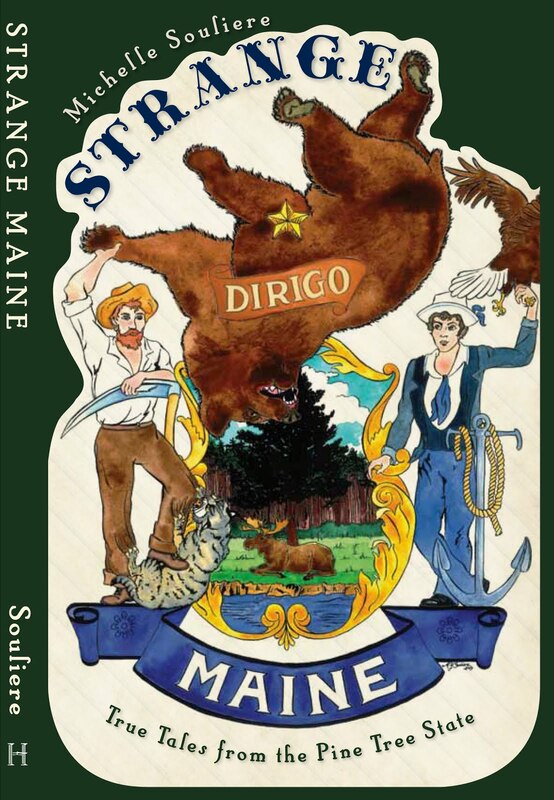 Well, the time has come again for talented mentalist Rory Raven to visit the state of Maine from his home base in Providence, Rhode Island. The show, conveniently for those of us with mothers whose curiosity gets the better of them, is being held on Mother's Day, next Sunday! 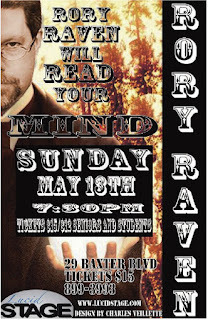 WHAT: Rory Raven Will Read Your Mind! COST: $15 per person. Moms in attendance will be given a flower and a free drink! Bring your Mother for a bonding experience of a lifetime!